(Kitco News) – Asian and European stock markets were mixed overnight. U.S. stock indexes are pointed toward slightly lower openings when the New York day session begins. 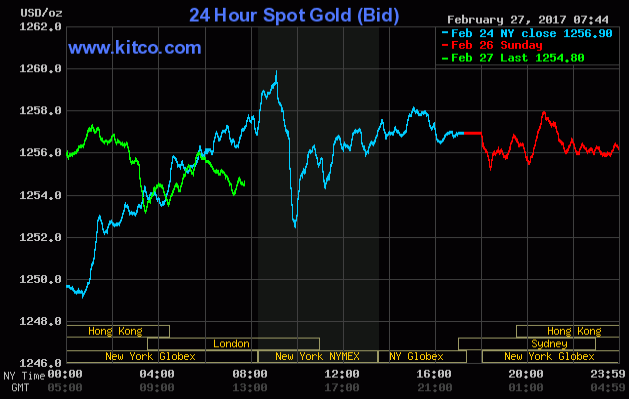 Gold prices are slightly lower early Monday on a mild profit-taking pullback after scoring a 3.5-month high on Friday. The marketplace this week will focus on U.S. President Donald Trump's speech to the U.S. Congress on Tuesday evening. He will provide U.S. lawmakers with his plans for growing the U.S. economy, as well as other domestic and foreign matters. U.S. Federal Reserve officials, including Chair Janet Yellen, are also scheduled to speak this week. Their comments will be closely scrutinized following last week's FOMC minutes that were deemed by many market watchers as a bit dovish on U.S. monetary policy. In overnight news, the European Union's European Commission reported that its economic sentiment indicator rose to 108.0 in February from 107.9 in January. The February reading was the highest in six years. The key "outside markets" on Monday morning find the U.S. dollar index near steady. The dollar index is still in a fledgling price uptrend on the daily chart. Meantime, Nymex crude oil futures prices are firmer today. Oil prices are still in a sideways and choppy trading range that has bound that market for weeks. U.S. economic data due for release Monday includes durable goods orders, pending home sales and the Texas manufacturing outlook survey. Gold is a barbarous relic! Stay with U.S. Treasuries!